One of my all-time favorite writing topics focuses on writing showing sentences instead of telling sentences. The anchor chart below highlights the difference between a showing sentence and a telling sentence. Basically, a telling sentence in a story is usually a short sentence that tells about an incident in a vague, uninteresting way. Simple emotion words like sad, angry, brave or embarrassed are common in telling sentences. Showing sentences, on the other hand, use vivid verbs, descriptive words, and creative details to describe an incident. 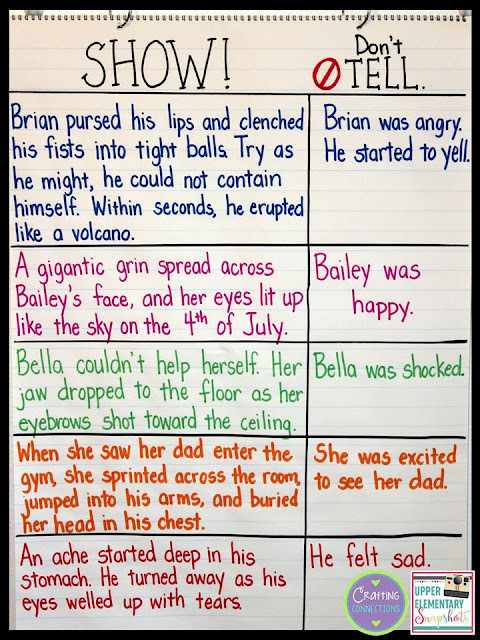 A few years back, I wrote a blog post describing a successful writing lesson I co-taught with third grade teachers to introduce the concept of "Show, Don't Tell" to our students. You can check it out HERE. Recently, I decided to create a follow-up lesson. I wanted to highlight showing sentences written by published authors, so I combed through several upper elementary chapter books (The Tiger Rising by Kate diCamillo, The Bridge to Terabithia by Katherine Paterson, Loot by Jude Watson, and Three Times Lucky by Sheila Turnage to name a few) and copied down a handful of sentences that I felt were stellar examples of showing sentences. 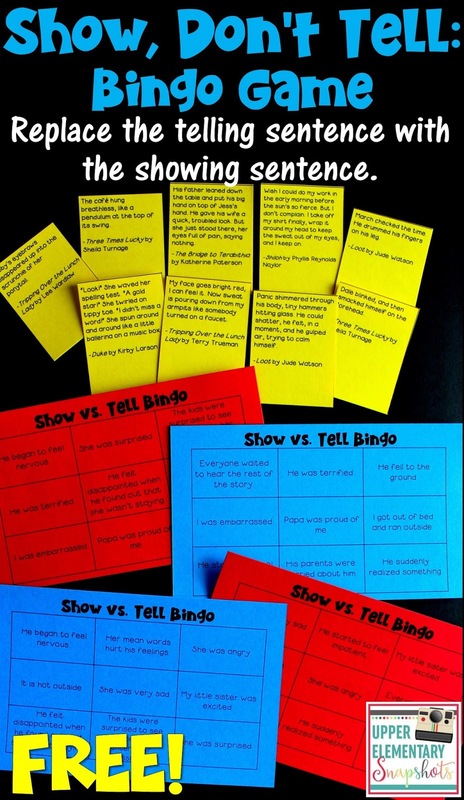 Then, I used the sentences to create a Bingo game! Of course, you can use these FREE printables any way you want, but here's my vision for how I would use them in an upper elementary classroom. To prepare this activity, before class you need to print the Bingo cards and calling cards, and gather markers of some sort. I created 14 Bingo cards because I would make this a cooperative activity, where students share a card with a partner. To start the lesson, I would distribute the Bingo cards, and ask students to scan the statements on their cards and discuss with their partner whether the statements are telling sentences or showing sentences. After a brief discussion, I would tell my students that during today's lesson we are going to find showing sentences that could replace these mundane telling sentences. Furthermore, to make it just a bit more exciting, I've turned it into a Bingo game! We're going to see which pair of students can be the first to cover their entire Bingo card. Next, I would draw a calling card, place it beneath my document camera so that it's projected on the screen and visible to the entire class, and read the card aloud. (If using your document camera, be sure to use the cards that don't have the answer printed at the bottom!) I would then instruct students to work with their partner and scan their card to determine if any of their telling sentences could be replaced with this showing sentence. After an appropriate amount of time, I would ask volunteers to raise their hand if they think they found the matching telling sentence on their card. Once the match has been identified, we would briefly discuss why this showing sentence would be so much more interesting to a reader than the telling sentence on the Bingo card. CLICK ON THIS IMAGE OR THE IMAGE BELOW TO DOWNLOAD THE FREE FILE! Finally, when the game is over, I would instruct students to retrieve their writing folder and look over a personal piece of recent writing for a telling sentence that they could revise and rewrite as a showing sentence. If you are looking to dive a little bit deeper into this writing topic, I invite you to check out my related PowerPoint and flipbook! Thanks for stopping by today! 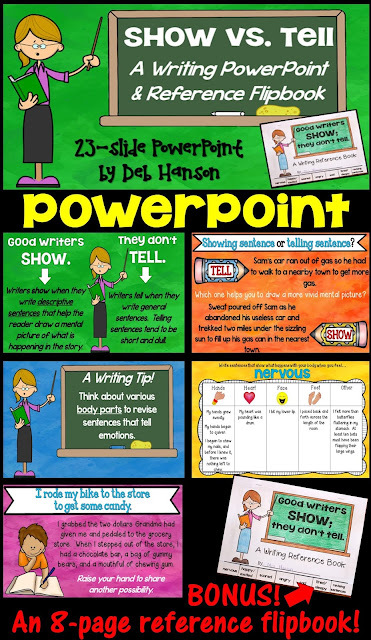 I hope you'll be able to use a few of these writing ideas with your upper elementary students!